The biggest surprise was Kansas beating Texas Tech by 16 points this weekend. I thought TTU would win. My faith in the Red Raiders grew when Marcus Garrett was ruled out along with the emotional punch the NCAA gave Kansas the night before the game in handing down the Silvio De Sousa suspension. He’s out the rest of this year and next year. I wrote about his potential impact last week. Kansas could have won by 30, it felt like, against Texas Tech, but started putting the walk-ons in with almost three minutes left to play. Another surprise was how well Texas played in Ames. 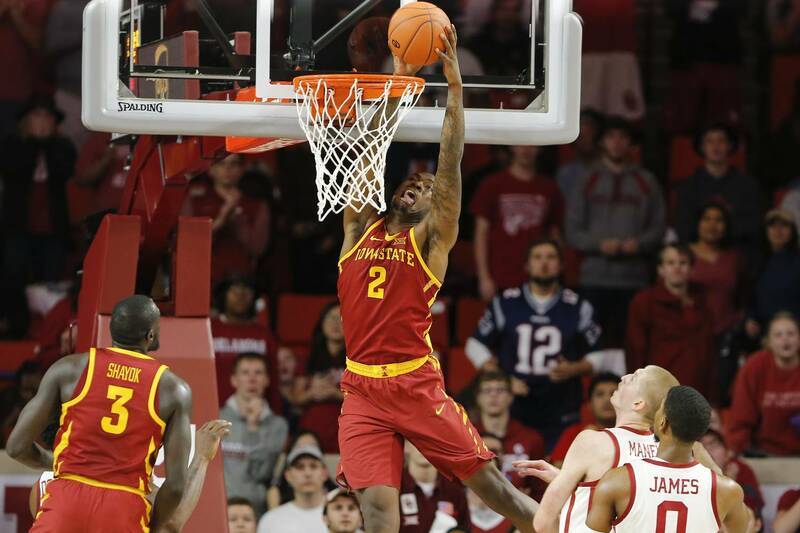 That combined with Iowa State’s one-point road win in Norman on Monday, you wonder if the Cyclones are about to hit the same skid Texas Tech, Kansas, Kansas State and, well, everyone except Baylor, has. But they won both of those games, so don’t delve too deep into it. Kansas State seniors finally beating Kansas was good to see considering this is a group of seniors who had to endure the “Great Eurostep of 2017” and the “Ask Fran” loses in the past to KU. I’m not a huge fan of court storming in general, but it really bugs me when a team that’s in first-place, was favored to win and had been playing better than its opponent over the last month, has its fans storm the court following a win. I get it — kids don’t have to get off my lawn. But I find it a tad disrespectful to Kansas State that their own fans thought this was a “storm the court game,” which are usually reserved for big upsets. The Wildcats should have beaten Kansas and they did. I guess no one told their fans that. Texas beating Baylor wasn’t surprising to me. Texas bulldozing Baylor was, but then you learn that Makai Mason was limited with an injury, it makes sense. Texas winning at home against a red-hot Bears team is another sign that as the games get bigger, winning on the road becomes more difficult — it was always difficult, but it’s a lot easier to sneak up on teams and win on the road in January than February. Texas was talking about the Big 12 standings after the win. If they go 2-0 the next two games then maybe the Longhorns have a point. But knowing this program under coach Shaka Smart, they could easily lose in Morgantown on Saturday. Two steps forward, one step back is kind of Smart’s history at Texas at this point. I remain perplexed by TCU. Two non-competitive road loses in a row and then the Horned Frogs nearly lose to the worst team in the league, at home, in Oklahoma State. TCU needed a J.D. Miller buzzer-beater to beat OSU on Wednesday, 70-68. It’s not a good sign. And they even got an epic performance from Desmond Bane (26 points, 6-of-9 from 3-point) in that game. TCU has so much talent and a great starting five, but mid-season transfers of Kaden Archie (the top high school recruit in their 2018 recruiting class), Yuat Alok (the top-rated JUCO player of the 2018 class), redshirt freshman Angus McWilliams and Jaylen Fisher — who was probably lost of the year anyway with an injury — have really taken a toll on TCU’s depth and damaged their 2019 season projection. TCU and Oklahoma’s tournament futures are shaky in early February. At West Virginia; Kansas State; Oklahoma State; at Oklahoma; Iowa State; at Texas Tech; TCU. I don’t think Texas can win at Lubbock, but all the other games on Texas’ schedule are games the Longhorns can and should win. Kansas State is a different team then the one the Longhorns smoked in Manhattan. However, had UT won by two or three possessions, I’d say a payback game is certain. But winning on the road is hard and Texas won in Manhattan by 20 points. Texas also gave the Red Raiders a tough game in Austin, and TTU’s offense struggles at times no matter where the game is played. Iowa State can lose in Austin. The Cyclones nearly lost in Ames to Texas. Texas Tech; at Baylor; at TCU; Texas; West Virginia; Kansas; at Kansas State. Considering the game against Kansas could, potentially, be where the 15-year reign of Jayhawk terror is decided, that’s about as spoilery as it gets. Baylor beat OU by 30 points last week, but I don’t think Baylor can count on another 30-point beat down even if it’s in Waco, especially if Mason isn’t going to be healthy this month. TCU is drastically under-performing in this league based on its roster. No one is killing Jamie Dixon because he had four surprise transfers and the program is still just TCU. But Desmond Bane disappears in games, Alex Robinson is not a superstar scorer and Kout Noi is having a sophomore slump. At Iowa State; Kansas; Oklahoma; Iowa State; at West Virginia; Texas Tech; Kansas State; at Texas. Translation: winning in Fort Worth will decide whether or not we have an outright champion or champions. How the top five Big 12 teams win the league, but first, take a look at this from the Lawrence Journal World. The thing that sticks out to me is how close to the edge of losing Texas Tech sometimes plays at home, but usually wins the game. Oklahoma and Kansas State were very close to doing it, Iowa State did. I think 12 wins will get a share of the conference title, which means Texas Tech can only lose two more games. Lucky for them, three of their remaining eight are against lowly OSU and shrinking Oklahoma. Given Kansas’ road struggles, it’s easy to see Texas Tech bouncing back in a revenge game against KU that will be a 7 p.m. tip and could get an ESPN Gameday appearance. Same kind revenge factor can be applied to the Baylor game. I think Texas Tech wins those five games to get to 11 wins. TCU, like Oklahoma, is in a funk. Back-to-back non-competitive road games from the Horned Frogs was weird. It’s OK to drop road games this season, but to be blown out is another story. But TCU is 4-0 at home and will be looking for a signature win that they don’t really have, yet. If TCU misses its chance to beat Kansas on Big Monday, this Tech game another opportunity. Obviously with Iowa State celebrating senior night, Texas Tech will have its hands-full. If the Red Raiders can hold strong at home and go at least 2-2 on the road, they could get it done. Prediction: The margin for error is slim. Texas Tech is not the same team on the road– go watch the Kansas game– and while it gets great crowds, I don’t think teams are intimidated to play in Lubbock, yet. I project an 11-7 record for Tech. I’m not really sure what to think of the Lagerald Vick departure. He’s taking a leave of absecene, which suggest he may be back, but there’s no timetable, which suggests he may have played his final game of the Jayhawks. He was averaging more than 14ppg., but anyone who has watched the Jayhawks play multiple games knows how wildly inconsistent he is when’s on the court. He makes a ton of difficult shots, he misses a lot of easy shots and he turns the ball over. Part of me feels Kansas may have removed a problem in the locker room with him gone. Another part me thinks Kansas will never recover losing a guy who had made 66 3-pointers this season. It would be amazing if the streak ended this year but Kansas went 9-0 in Allen Fieldhouse. It could happen. Tuesday’s Sunflower Showdown told me one thing: Despite Kansas’ 23 turnovers, lack of second half foul calls (KU shot just four free throws) and foul troubles — Ya’ll, those last two things aren’t going to happen in Lawrence— the Jayhawks trailed by just a possession in the final two minutes on the road against first-place Kansas State. Baylor is a tough game to have on Senior Night, but the last time Kansas lost on Senior Night was in 1983. Kansas was up 17 on Baylor at one point in Waco. It’s not a great matchup for the Bears. The two other home teams Kansas plays are the two worst in the league, so 9-0 in Allen Fieldhouse looks likely. So about those road games? I think Kansas is losing at Texas Tech. While Bill Self’s teams almost always have some sort of surprising road win, I don’t think Tech is slipping up against KU this year after losing in Lubbock last season. So that means for Kansas to get to at 12 wins, they need to go 2-2 on the road with other games against OSU, OU and TCU . There’s a chance OU could be demoralized by the second-to-last game of the regular season. I think TCU will be a tough game for KU. Wow, is Kansas going to do this? Prediction: Yes. I think Kansas gets to at least 12 wins. I think KU played it’s best game of the season against Texas Tech and then played well, albeit sloppy, against Kansas State. Part of the magic with Baylor’s January run in Big 12 play had to do with scheduling and jumping on teams who underestimated the Bears. Part of it had to do with Makai Mason becoming healthy and unstoppable. I think Baylor is about to go on a massive slide. That schedule is pretty brutal and no one is sleeping on the Bears anymore. It started against Texas on Wednesday, when Baylor was flat-out out-played. If Tuesday against Kansas is any indication, I hate Kansas State’s matchup against Baylor’s zone, but I think Kansas State will be more prepared for it this weekend. Dean Wade ought to kill 2-3 zones, and he started heating up in the second half against KU. To get to 12-6, Baylor would have to go 6-3 down the stretch. With four of the most difficult league games there are on the road. Just 1-3 in that stretch would be monumental. I lean 0-4. That means just to get to 11 wins, they would have to go 5-0 at home with Kansas State and Texas on the schedule. Prediction: Baylor doesn’t do it. Those four road games are too brutal and although I could see them going 5-0 at home and getting to 11 wins, that won’t do it in the this league. The number-crunchers at Kenpom say Iowa State is the team who likely wins the Big 12 this season. The Cyclones certainly have a good shot. On paper, the remaining road games indicate ISU has a favorable schedule. At Kansas State is a game I expect Iowa State to lose. At West Virginia is a game I expect Iowa State to win. But I wouldn’t just hand victories to ISU against TCU and Texas. While I think those are winnable games for ISU, the Longhorns pushed ISU in Ames. The Cyclones haven’t played TCU yet but I would predict a showdown between two teams with a lot of shooters. I just don’t see ISU losing to Texas Tech on senior night– I don’t envision ISU losing again at home, to be frank. If they do, it’ll be to Baylor, but ISU really figured out Baylor’s zone in the second half in their loss at Waco. To get to at least 12 wins, ISU needs to go 4-0 at home and at least 1-3 on the road. Prediction: Yes, I think Iowa State gets to 12 wins and possibly more, though I kind of like Texas in that game in Austin. Kenpom sees the same thing I do. The problem will be the things you can’t predict, like West Virginia playing its best game of the year on Senior Night. Maybe Texas Tech does to ISU what Kansas State did to them (held ISU to 54 points). Still, that’s kind of wishful thinking. To get to at least 12 wins, Kansas State can only lose four more times. I think Kansas State will not win in Allen Fieldhouse. I lean Baylor this weekend if Mason is healthy. The rematch with Iowa State will be one of the best games this month. I don’t like Kansas State’s matchup with Texas in Austin. If the Horned Frogs are the team they were for most of January, that game in Fort Worth becomes a very difficult one for KSU, especially coming on Big Monday following KSU’s game against Baylor in March. Prediction: Kansas State wins at least a share of the league and gets to at least 12 wins. While they lose at KU, Baylor and Texas. KSU, I think, is going at worst 4-1 in the other games. They have the best shot at winning it outright. TCU hasn’t beaten Kansas in the regular season under Jamie Dixon. The Horned Frogs upset Kansas in Dixon’s first season during the Big 12 Tournament, but that has been it. In that time, most of the regular season games have been extremely competitive, including the KU win in January. Kansas needs to win at least two road games to have a chance at winning the league. This is the second-most difficult road game they have remaining. TCU hit a massive skid with blowout loses to Tech and Baylor and nearly lost at home against OSU on Wednesday, winning 70-68. If Kansas wins this game, we’ll look back at this game as a big reason why KU kept the streak alive. If TCU wins, it should help its case on what now could be a nervous Selection Sunday in Fort Worth. Kansas needs Marcus Garrett back on Monday. I can see why he’s doubtful for the OSU game (I don’t think they’ll need him), but without him and Vick on the road? I don’t see Kansas winning without him. What a difference a month makes. Texas demolished Kansas State to open the Big 12 season but has been unable to win anywhere expect Austin since then. Meanwhile Kansas State got Dean Wade back and has only lost once in league play since falling at Texas Tech. Maybe it’s the state of Texas Kansas State hates. The Wildcats lost in Lubbock and College Station to Texas A&M during the SEC/Big 12 Challenge. Texas needs this one more than Kansas State, as this game is another opportunity to lift the Longhorns, who have suddenly become an interesting bubble team because of 10 losses but lots of great wins. I like Kansas State, though, to make Texas’ tournament dreams suffer a little but it’s not a given. The Wildcats have played well on the road. I like the matchup though for Texas, and K-State should struggle with Jaxson Hayes — then again, everyone is struggling with the one-and-done big man. Pretty simple: Oklahoma needs to start beating teams at home if they want to get invited to the tournament. Texas Tech can be very average away from Lubbock. The first matchup in Lubbock was entertaining and OU had the Red Raiders on the ropes at time. This matchup should be fun. This is a statement game for TCU. Given how bad the Horned Frogs played at Lubbock and Waco, the pressure could be on Iowa State to win big at home. A second home loss for Iowa State really does hurt their league chances. This comes down to the extent of Mason’s injury. He played 23 minutes in the loss to Texas on Wednesday. An injury suffered on Monday in practice was blamed. Mason scored only five points. If Mason is not the guy who carried Baylor to all its Big 12 wins this season, including 40 points against TCU, then Baylor turns into the team most thought would finish ninth in the Big 12. Mason’s injury will have the same impact Keenan Evans’ injury had on Texas Tech last season. It’s just a wrench thrown in to all projections. Kansas State is good enough to win in Waco as it did at Iowa State and Oklahoma. Will the Wildcats suffer from “just beat Kansas syndrome” that most team get after beating the Jayhawks? We’ll see. Regardless, most teams play better after bad loses and if Mason is back to somewhat healthy and more of a factor than he was against Texas, then I expect to see Baylor winning this game and Kansas State struggle against the zone.